7/22 Cup of Coffee: Greenville grabbed a win in a pitcher's duel thanks to Logan Boyd's (pictured) best start of the season. The Spinners erupted for 13 runs and Tyler Hill paced the offense again. The GCL Sox rallied for six unanswered runs late to grab a win. Salem battle back from a three-run deficit only to see a near win slip away in the ninth. The PawSox fell in a frustrating game, losing on a walk-off walk in the 14th inning. Jantzen Witte went 2 for 6 with a double and an RBI. 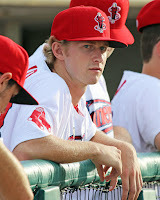 Henry Owens lasted 5 2/3 innings, allowing four runs on nine hits while walking three and striking out four. Rusney Castillo was removed from the game after fouling a ball off his foot. He was 0 for 3 when he was replaced. The bats fell silent against the Mets on Thursday, as Portland could only muster three singles and one extra-base hit all evening. Yoan Moncada went hitless for the second straight night, going 0 for 3 with a walk. Moncada also committed an error, but it was only his first in 22 games at Double-A. Andrew Benintendi also went hitless, also going 0 for 3 with a walk. Mauricio Dubon hit the only extra-base hit of the night for the Sea Dogs, collecting his fourth triple since his promotion. Jacob Dahlstrand was charged with the loss, giving up four runs on eight hits in five innings pitched. He walked two and struck out one. Salem rallied from a 6-3 deficit with a big six-run sixth inning, but the bullpen could not hold on. In his second inning of relief, Simon Mercedes gave up a walk-off, two-run home run with one out in the ninth. Nick Longhi, Mike Meyers, Danny Mars and Jordan Procyshen each had two hits and an RBI in the game. Joseph Monge drove in a pair on a 1-for-4 night. Salem could have had even more runs, but the Red Sox left nine runners on base. Travis Lakins was rocked for six runs on nine hits in four innings of work and gave up a pair of home runs. Drive pitchers held Greensboro to just two hits, as Logan Boyd authored a stellar start. The 22-year-old lefty allowed just one hit in seven innings of shutout ball, walking two and striking out eight. Jake Cosart fought his way out of a ninth-inning jam to earn his first save with Greenville. He struck out two in the inning. Kyri Washington was at the plate for both Greenville runs, but he only got an RBI for one of them as the second came on a double play in the sixth. He went 1 for 4 and drove in his 58th RBI of the season. Josh Ockimey went 1 for 4 with a double. The Spinners exploded for 14 hits and Tyler Hill was once again at the heart of the action with a 3-for-6, two-RBI performance. The red-hot Hill now has hits in the last 13 games he has started and has raised his average to .377. Tucker Tubbs blasted his third home run of the season with a two-run shot in the first. He had a strange box score on the game, going 1 for 4 with three runs scored. Catcher Isaias Lucena went 3 for 5 with a double, an RBI, and two runs scored. Darwinzon Hernandez labored through five innings but picked up the win. He gave up a run on two hits and four walks but struck out five. Kuehl McEachern continued to dominate New York-Penn League competition, striking out five of the six batters he faced in relief. The GCL squad scored six unanswered runs to grab a come-from-behind victory. After two runs scored on an Orioles error to tie it and a go-ahead RBI groundout by Samuel Miranda, shortstop Yomar Valentin launched a two-run home run - his first of the season - to give the Red Sox some insurance. Lorenzo Cedrola went 3 for 4 with a double and a run scored. The first DSL squad fell late in a pitcher's duel in which the two teams combined for just seven hits. The Red Sox's one through four hitters had a base hit each and the five through nine batters were each held hitless. Alejandro Rodriguez was solid over six innings of shutout work, giving up just two hits while striking out two and walking one. The loss was charged to Eduard Bazardo, although both runs that were scored were unearned. A ninth-inning rally came up just short for the second DSL team, leaving the tying run on second. Yeison Coca went 2 for 5 with a double and an RBI. Jose Gonzalez shined over six innings of work, giving up two runs on five hits. He struck out four and walked one. Player of the Night: Logan Boyd authored his best start of the season with his seven-inning gem. The eight strikeouts were a season high for him. In 19 starts for Greenville this season, the 2015 19th-round draft pick out of Sam Houston State has a 5.12 ERA with 75 strikeouts and 21 walks.